Spyro: Enter the Dragonfly is the fourth game in the Spyro series, the first Spyro game for the sixth generation consoles, PlayStation 2 and Nintendo GameCube, and the first console Spyro game not developed by Insomniac Games. It is also the first game not to be exclusively released on one console. The story begins shortly after the Dragonfly Kingdom's party is about to begin. The dragons, Nina, Flash and the dragonfly people are in celebration of a rite of passage for the young dragons, with the arrival of new dragonfly guardians for the young dragons. However, it's Stella's Birthday and she's coming to the party at the Sorceress's castle. During the party, Ripto who appears to have survived the events of teleports in via a portal and disrupts the celebration, expects Sparky, X-5, Betty, Blink, Cyndia, Flutter, Sparx and Stella intent on capturing the new dragonflies to weaken the young dragons. However, his spell misfires, and a whirlwind blew off Spyro's allies and the dragonflies become scattered throughout the Dragon Realms. Spyro and the allies is tasked with recovering the realm's new crop of dragonflies and rescues Nina, Flash, The Sorceress and the Dragonfly People. After Ripto's defeated and saves Nina, Flash, The Sorceress and the Dragonfly People. Stella saved the Dragon Realms just in time for Stella's Big Birthday Bash at the Sorceress's Castle. 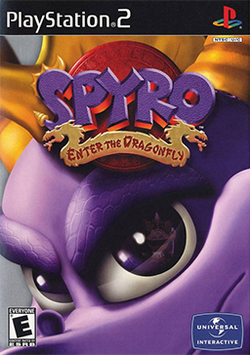 The game was originally going to contain around 120 dragonflies to collect (not including Sparx), over 25 levels, a framerate of 60 frames per second, and fast loading times. However the game was rushed in order to be available by Winter 2002, and therefore suffers from an inconsistent framerate, long loading times, graphical glitches, sound issues, and lock-ups (freezes). Additionally, there are only 9 levels and only 90 dragonflies for the player to collect. ↑ Preview of Spyro: Enter the Dragonfly. This page was last edited on 11 May 2014, at 16:26. This page has been accessed 8,660 times.